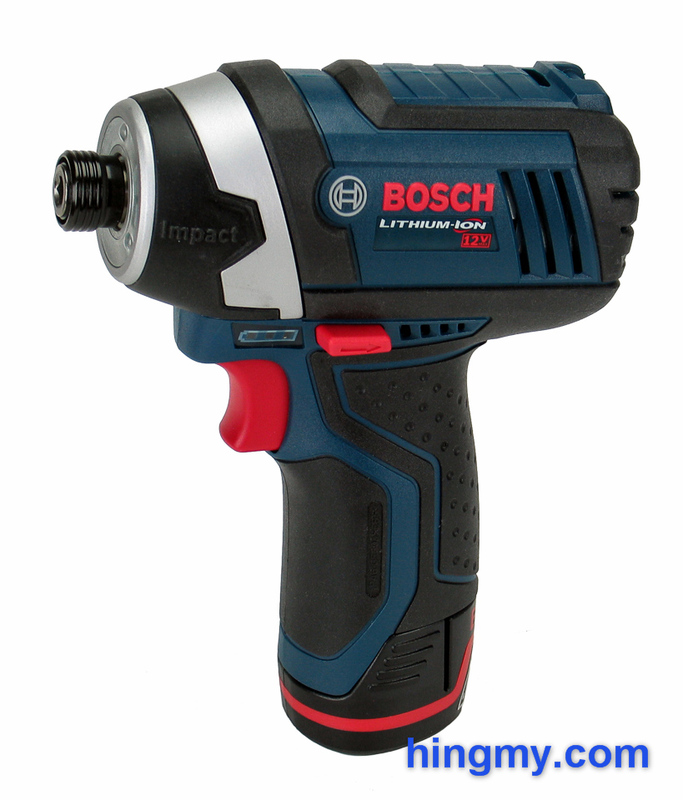 The Bosch PS41 impact driver is a member of a new generation of tools: 12V tools that perform like the 18V tools from only a few years back while being half the size. The best impact driver we have ever tested fits this description. Naturally we had to take a look how Bosch's entry compares to that tool. 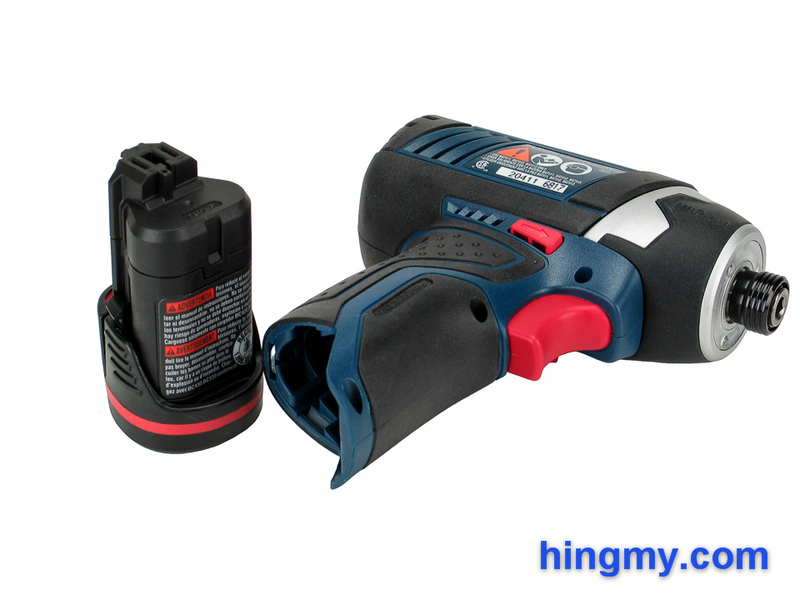 The Bosch PS41 is a 12V impact driver with a standard hex chuck. It has been design primarily for medium duty tasks, but can punch in a higher weight class as long as there is little work to do. The 78 ft-lbs of torque the motor produces are not impressive, but they are more than enough to work with medium size fasteners. In this environment the PS41's small size, low weight, and good build quality become an asset. The PS41 shows its Bosch pedigree with its solid build. Rubber bumpers cover all the exposed edges, including parts of the metal gear housing at the front of the tool. The Battery snaps into place with conviction. The PS41 won't take any damage from being used as hammer to dump pieces into place for fastening. With the battery installed the PS41 is ever so slightly top heavy. Most of the time this does not matter, especially when driving long fasteners. While doing fine work, however, we noticed that getting the PS41 into position takes a little more care than it should. The battery is one of the strong points of the PS41. The little 12V unit provides a surprising 1.5Ah of power, giving the driver great endurance. Bosch does not sell a bigger battery that fits their 12V tools. We do not miss this option, since all tools in the 12V range are engineered for medium duty work. A heavier battery would just add weight. The rapid charger that goes with the battery is equally well built. It brings a dead battery back to a full charge in under 30 minutes. Clear labels and couple of LEDs indicate what the charger is doing at any given moment. The plastic housing of the charger is better built than most. With some care it will survive on the job site. Three green LEDs built into the grip just above the trigger show the status of the battery. They light up every time the trigger is pulled. Three LEDs are only good enough to indicate the battery load level on the roughest of scales. Most of the time you'll simply ignore the state of battery and use the driver until the battery runs dead. Very rarely will a quick glance at the indicator actually entice you to change the battery. Two LEDs lit together are a bit of a white whale. They are very hard to spot in the wild. The PS41's status indicator always seems to indicate a full charge, or one LED of power remaining in the battery. The PS41 is equipped with a three LED lighting system, which comes on and turns off with the trigger. The LEDs are arranged in a circle around the chuck. This setup eliminates the shadows that appear above the impact point on tools equipped with a work light above the trigger. No matter how you use the PS41, the impact point will always be lit. Unfortunately not everything is rosy. The plastic lenses that are meant to focus the light do more harm than good. Firstly they turn what is pleasant white light into washed out yellow light. That could be excused, if the lenses would distribute the light evenly. Unfortunately each lens creates a dot of distorted light right in front of it. When the tip of the driver touches the work piece the three lenses create a pattern of three dots around it. All of this adds up to a lackluster experience. The PS41's lights always illuminate the area in front of the tool, but the busy light pattern they produce creates a distraction that should not be there. Bosch got it almost right with this one. Our standard 3 inch screw driving test tells most of the story. The PS41 has no trouble driving a 3 inch screw into construction grade lumber. It's the pace that's a little off the mark. It takes the PS41 around 5 seconds to complete the job. This is much slower than the time a construction grade driver puts up on the leader board. The PS41 is only able to hold its respectable 2,600 rpm top speed for the first quarter of each screw. Progress slows down rapidly as the hammer gears progressively works harder. Endurance is adequate, but not spectacular. In all but our torture tests the charger restored the spare battery before we had a change to drain the one installed in the tool. If you are working within the tool's design envelope you'll never miss the option to install a larger battery. Like most drivers of this size, the PS41 gets noticeably hot when used continuously. It soon becomes apparent that this tool was not engineered for heavy use. We stopped our test when the grip became uncomfortably hot, not wanting to push the driver to the point of failure. Overall our tests paint a vivid picture. The PS41 is clearly a medium duty impact driver. It does its best work driving medium size fasteners at a measured pace. 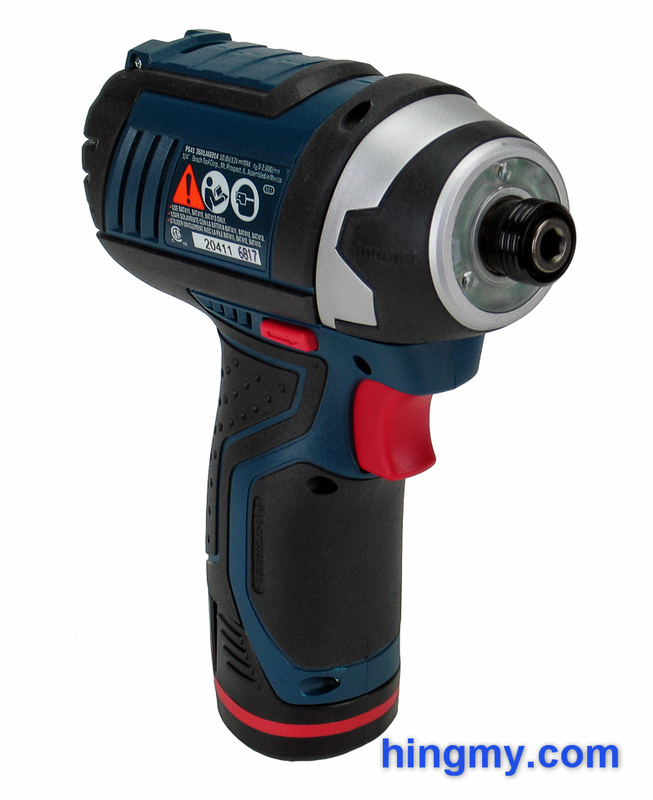 It can do the work of a much larger impact driver, but it will do so at a much slower pace. The Bosch PS41 is a good tool for installers, finish carpenters, and anyone who does not have to drive a lot of fasteners at a time. The PS41 is part of Bosch's 12V system. While the battery and charger are well engineered, Bosch did not get around to creating a lot of tools for this battery system. Your selection is somewhat limited. The PS21 screw driver and PS60 reciprocating saw have done well in our tests. Hopefully they are a sign of what is to come from Bosch. 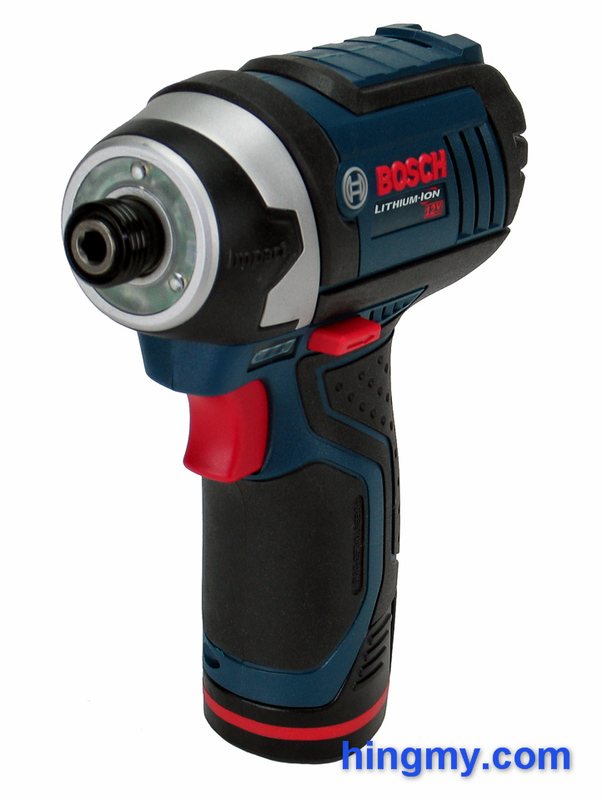 The Bosch PS41 is a well-built impact driver that excels at driving medium duty fastener. Somewhat lacking in motor speed and power the driver slows down rapidly as the work gets tougher. A slightly weird work light, a good charger, and very solid body do lift the PS41 to the level of a professional tool. If you work within the tool's design envelope, the PS41 will never leave you short of power, endurance, or speed. Bosch made a few small mistakes designing this tool leaving the PS41 ever so slightly off the mark. The PS41 is by no means a bad tool, but there are other impact drivers that beat it fair and square. If the price is right, the PS41 is a good buy.